When a voice wakes you up in the middle of the night and tells you to write a mystery series, what's a writer to do? That's how Virginia King came to create Selkie Moon, after a massage from a strange woman with gifted hands was followed by this nocturnal message. Virginia sat down at the keyboard and waited until Selkie Moon turned up. Soon Virginia was hooked, exploring far-flung places full of secrets where Selkie delves into psychological clues tangled up in the local mythology. Before Selkie Moon invaded her life, Virginia had been a teacher, an unemployed ex-teacher, the author of over 50 children's books, an audio-book producer, a workshop presenter and a prize-winning publisher. These days she lives in the Blue Mountains west of Sydney with her husband, where she disappears each day into Selkie Moon's latest mystery. Bliss. Wow! Just, wow! That's exactly what I thought when I finished reading The First Lie, which is Book One of the Selkie Moon Mystery Series by author Virginia King. This book gripped me from the very first page and kept me obsessively reading it all the way through to the last! Follow the story of Selkie Moon, a woman who has fled the clutches of an abusive husband and a controlling stepmother, uprooted her life from Sydney and moved to Hawaii, in the hopes of finding peace. But when mysterious and scary things begin to happen to her, even in her new environment, Selkie begins to wonder if she truly has made the right choice. The further Selkie goes in trying to find the truth, both of what is occurring now, and the truth of who she truly is, the more twisted and fascinating the tale becomes. I loved The First Lie. Loved. It. How's that for a review? Well, it's how I really felt about this excellent start to what promises to be a fantastic new paranormal mystery series by author Virginia King. This story is unique and interesting, the characters, especially Selkie, are vividly drawn and relatable, and the story line is just fantastic. Any reader who enjoys mysteries, paranormal fiction, novels with a strong female protagonist, or just a great read of fiction in general will absolutely love this book. I am so pleased to highly recommend The First Lie and I am very much looking forward to reading more from author Virginia King as soon as I am able to! The First Lie: A Selkie Moon Mystery is a paranormal suspense novel written by Virginia King. While she was already in her mid-thirties, Selkie Moon felt as though she had been living a half-life her entire existence. Her mother committed suicide when she was a toddler, and Selkie was raised by a troublingly diffident father and the stereotypical cruel step-mother. When she was sixteen, her step-mother even changed her name after they had had a bitter argument; a change which made Selkie feel as though she had lost her very identity. Then her adult life was marred by a loveless marriage to an emotionally abusive husband, who became a stalker after they separated. But it was all going to change now since Selkie had left Sydney, Australia and all that baggage from the past behind and moved to Hawaii. She found a flat, complete with an irrepressible and free-spirited flatmate, and was working on producing her own company’s goal-setting seminars. Selkie still, however, was haunted by troubling dreams of whispers and the repeated refrain that someone was trying to kill her. 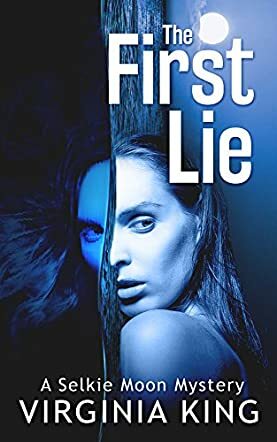 Virginia King's paranormal suspense novel, The First Lie: A Selkie Moon Mystery, grabs the reader with the first few lines and doesn't let go. I wasn't sure what to expect from a novel whose protagonist had the name Selkie Moon, and feared yet another coming of age shifter fantasy. I was wrong. To my delight, I found I was reading a first-rate psychological thriller with finely wrought characters, a tantalizing puzzle and just a touch of romance, all delivered with the sights, sounds and marvels that are Hawaii as a background. And while Selkie is way past being a young adult, The First Lie does very much count as a serious coming of age novel, belying the fallacy that coming of age is only for the young. Selkie's break for freedom and move to Hawaii does more than just make her feel strong enough to reclaim her name, it sets her on a path to discover her identity and reclaim her soul. I had a grand time reading The First Lie. It's absorbing, suspenseful and an absolute joy of a novel that’s perfect for sinking one's teeth into on a dark night. The First Lie: A Selkie Moon Mystery is most highly recommended. The First Lie by Virginia King is the first book of the Selkie Moon Mystery series. Selkie Moon is a motivational speaker, freshly relocated from a bad marriage in Australia to the exotic Hawaiian tropics. Her fresh start comes complete with starting a new business from ground zero, but not without the help of newly acquired good friends and the appearance of a mysterious woman apparition who warns her against danger. As she struggles to get her business off the ground, she faces a greater challenge as she tries to understand why the ghost woman is haunting her. Virginia King hits a home run with The First Lie. Selkie Moon comes across as a real human being with real emotions and true-to-life responses to all the paranormal activity surrounding her. Her friends are likeable and loyal, the type of friends anyone would welcome into their inner circle. King’s pacing of the story is spot on and her plot is engaging. She also has sprinkled enough scene setting details to draw the reader into this tropical paradise without becoming heavy handed with it. In truth, the story could have been set anywhere and still been entertaining, but the fact it is set in Hawaii provides a little bonus that allows the reader to drift away for a mini virtual vacation. I look forward to reading more of the Selkie Moon Mystery series and seeing where else Selkie’s paranormal talents take her and her colorful array of friends. Consider me Selkie Moon’s number one fan. The First Lie: A Selkie Moon Mystery by Virginia King is a masterful blend of psychological thriller, mystery, and the paranormal. In her dreams, Selkie Moon hears the compelling, unmistakable voice that tells her: “Someone is trying to kill you,” and she knows she can’t take it lightly. She’s recently left Sydney for Hawaii with the hopes of starting her life over, but it seems her past or something sinister is catching up with her and she doesn’t know why. It will be fun to see her try to figure out what the recent events are pointing at while barely staying one step ahead of her stalker. Readers are thrust into an eclectic world that breathes mystery, and at every turn they expect something unusual to happen. Virginia King is a terrific writer and she deftly combines elements from different genres to weave a yarn that will have readers enthralled. A work of great imagination, The First Lie: A Selkie Moon Mystery reads very fast. The setting is one that readers will adore; the plot features elements of Celtic mythology, strong elements of suspense, and a style that keeps the reader’s eyes riveted on the pages. The writing feels like it’s driven by a powerful spell, irresistible, and utterly enticing. The characters are as complex as they are interesting, well-sculpted, and richly imagined. The beauty of the language plus the twists in the story make it a page-turner. This is one of those mysteries that had me fascinated and gripped from the very first page to the last. The curious thing is that its effects linger on long after the last page has been turned.